Every year Christmas is celebrated on this day. We love Santa and loads of gifts he brings to us. But, this time Santa has taken a turn and given us gifts in the form of apps for Windows Phone fans. Gameloft, a popular Windows Phone Game developer, is this days Santa as they updated two of their highest rated games in the Windows Phone Store with Xbox Live Support. 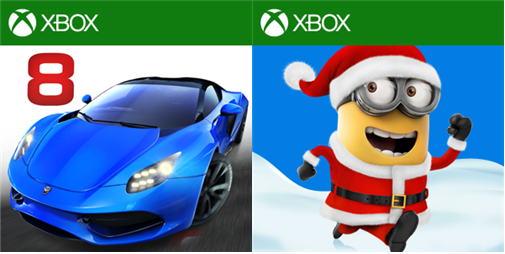 Yes, you heard it right, Asphalt 8: airborne and Despicable Me: Minion Rush are the two games that received huge update in the form of Xbox title. Read on to find what's in store. PRO KITS: Take your car’s stats to the limit… then break clear through to the sky! 11 NEW CARS: For the first time ever in a video game, drive the Tramontana XTR and Arrinera Hussarya along with other amazing speed machines. NEW LOCATION: Race, compete and survive the craziest & most challenging tracks we’ve ever created! HOLIDAY RUSH: Feel the winter spirit by burning rubber on 3 winter-themed tracks. NEW TOKEN SYSTEM: Nothing is beyond your reach now! Earn tokens to acquire exclusive cars, refill Fuel or buy Boosters. Stock up on tokens by playing events or purchasing them in the Shop. While the game is free , at the same time, a hefty 1GB(roughly) download which is a kind of thing users frown at. The game is an endless runner where you play as a minion and compete with others in hilarious, fast-paced challenges in order to impress your boss, (former?) super-villain Gru! The latest update takes the game to v2.5.0.17 which brings XBox Live Support, a new secret area, login rewards as part of 12 days of deals and more. THE ARCTIC BASE! This new area is full of snow, speed, and science! Take on cool new levels with unique obstacles and discover the TOP SECRET area: The Arctic Base interior! 12 Days of Deals: Check back every day for holiday promotions and login rewards.